Out from 16th May, the soundtrack features a first time collaboration with Oscar Winning Composer Hans Zimmer and acclaimed guitar duo Rodgrio Y Gabriela who have sold over one million records! We’re very excited because we’ve managed to track down the legendary Hans Zimmer, who told us a little bit about working with director Rob Marshall and Rodrigo y Gabriela. 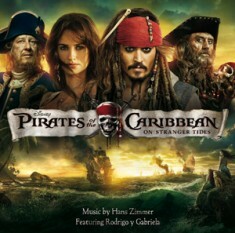 Pirates of the Caribbean: On Stranger Tides Official Soundtrack is out now – click here to pre-order your copy now!